Today, the Eagles signed a blocking tight end in Nate Lawrie as they also decided to release tight end Martin Rucker. Lawrie (6-7, 255), a former 2004 sixth-round pick of the Tampa Bay Buccaneers has not played in the NFL since 2008. In his career, he has pulled down four receptions for 43 yards and one touchdown. While Lawrie has not played in the NFL in nearly three years, he has been playing football. Last year, he played for the UFL's Sacramento Mountain Lions. Again, he did not have eye-popping numbers as he pulled in only 13 receptions for 134 yards and a touchdown. This will actually be Lawrie's second stint with the Eagles as he participated in offseason activities with the club in 2004. The former Yale product has a tough task in front of him. With Brent Celek a lock to make the club and rookie Clayton Harbor and Cornelius Ingram having higher upside, Lawrie is more likely a practice squad player or even released. As for Rucker, he spent most of training camp on the sideline with a hamstring strain. When he was on the field, Harbor and Ingram were beating him out. Rucker was picked up off of waivers by the Eagles in September and spent most of the season on the practice squad. Eventually he was elevated to the roster, but did not see action in the games. Either way, he was unlikely to make this year's 53- man roster. * RB LeSean McCoy became the third player to leave practice with dehydration since training camp started. He is expected to be fine and receiving fluids and IV's to get him hydrated. Still it is a scary situation since he said he saw stars as he was walking off the field. As a side note, Eldra Buckley replaced him on the first string offense with RB Mike Bell still being out. * Rookie LB Keenan Clayton finally returned to practice after missing the past couple of days with personal problems. It has not been confirmed nor have the Eagles released what the personal problems were that kept him out. * There is potentially horrible news for TE Cornelius Ingram. According to head coach Andy Reid, Ingram missed the part of the morning practice with swelling of his knee that has gone all the way down to his calf. This is bad news for Ingram who is coming off two torn ACLs in consecutive seasons. While Ingram has all the talent to be a very good player at this level, he is beginning to look like a lost cause. It is Sad because you root for a player that has been through as much as he has and hope he blossoms into a good NFL tight end. *Other players who missed practice today were center Nick Cole, DT Antonio Dixon, C A.Q. Shipley, DE Ricky Sapp and RB Mike Bell. 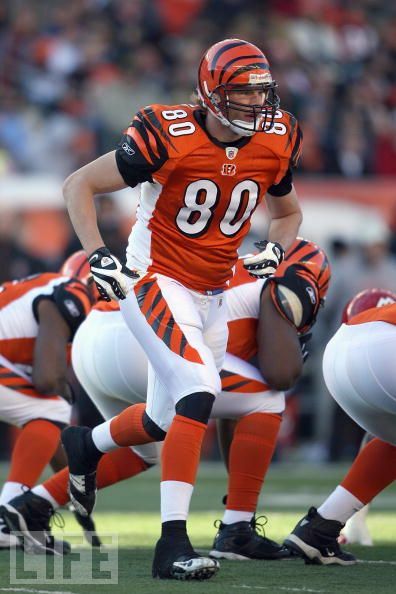 Also kicker David Akers missed practice due to a heel injury. A heel injury for a kicker could potentially be a nagging injury especially if it is his planting foot. Also, WR Hank Baskett sat out with a MCL sprain. Not good since Kelley Washington and Riley Cooper have been impressive in camp. 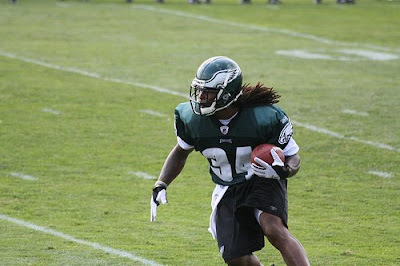 * When RB Eldra Buckley replaced LeSean McCoy (due to dehydration) on the first unit, he made a good impression. The Eagles threw him a lot of screen passes and passes attacking the linebackers. However, new LB Ernie Sims, like he has done throughout camp,laid the wood on Buckley. This was the non-hitting portion of camp. Buckley got up and his offensive lineman (Jason Peters and Mike McGylnn) defended their back and had a few choice words for Sims. Still, Buckley is making the most of his opportunities and with his special teams prowess, he has a good chance at making the 53-man roster. He is currently in competition with J.J. Arrington and Charles Scott (might make squad as a backup fullback). * As for Sims, he is really playing football with a passion. Makes you think if a team heading in the right direction drafts him that might have lived up to the lofty expectations and not have been an Eagle. He flies to the ball, is not afraid to make the big hit and is relentless. Stewart Bradley and Sims could transform the defense into a fierce and physical defense with speed. * Backup Michael Vick has had an up and down camp. Today was more of the same. While he was more accurate with his throws today, he was picked off by backup safety Quintin Demps in the 2-minute offense. 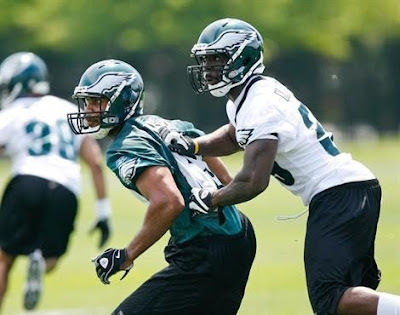 For the Eagles, rookie Mike Kafka is actually having a more impressive camp than Vick. The coaches have even raved about him being the most impressive rookie they have had in the last 15 years. Of course Vick is the main backup, but it would not surprise me if the Eagles could unload Vick for a pick that they'd sign Jeff Garcia to replace him. * Once again, the Eagles nickel package defensive line is playing like its hair is on fire. Daniel Te’o-Nesheim, Trevor Laws, Brandon Graham and Trent Cole are getting to the quarterback and making life hard for all of the Eagles quarterbacks. In addition, each player has the athleticism and quickness to drop back into coverage. This allows defensive coordinator Sean McDermott to drop lineman into coverage and bring the blitz out of nowhere. McDermott has to be licking his chops with the amount of pressure and disguises he can do with this unit. 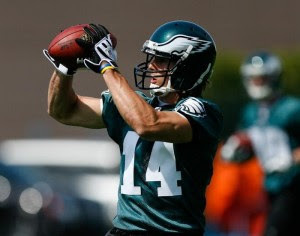 * WR Riley Cooper is making a strong case to be the team's No. 4 wide out. Cooper has consistently beaten every Eagles cornerback when he runs a slant route and fade routes. His size and physicality is too much for the undersized Eagles corners. This is a good news and bad news situation. Good that Cooper has been great, but bad since the Eagles corners will face tall receivers in Dallas, Green Bay, Indianapolis, Minnesota and others this year. * Most do not expect LB Tracy White to make the 53-man roster, but Keenan Clayton missing time with personal problems has given him a shot. Today, he ran the second-team nickel unit with Omar Gaither. Additionally, he is a special teams stud, which should not be overlooked. * Like Vick, QB Kevin Kolb has not been as sharp as he was as camp began. He was wildly inaccurate early in practice, but then made some amazing throws. Still, one has to think some of the pressure of being "the guy" is starting to get to him. Although he could be developing "dead-arm," which is common around this part of camp for a young quarterback. He has never thrown this many passes in camp and the offseason in his career, so do not be surprised if that is the case for his up and down play over the last five days. * Stewart Bradley is beginning to look like the player he was at the end of the '08 season. He is droppin g back in coverage and eliminating the middle of the field. When he is not dropping back, he is hitting the holes and shutting down the running plays before they start. If his knee holds up, the defense will be light years better than last year. *Lastly, RB LeSean McCoy left practice with dehydration, but before he left he did not look good. While linebackers do not have a chance to keep up with him in coverage, he loses focus and drops a lot of balls. Meanwhile, he has gotten better at blitz pick up, but he still has a ways to go. If McCoy continues to drop passes and fumbles the ball, Reid will be quick to go to Mike Bell who has a ton of NFL experience and some as a starter. I watched Lawrie in the UFL (kids gotta love the game) last year and he actially had a great season. Remember this was only an eight game season so 14 receptions (not 13) is not too shappy especially considering that they used him predominently as a blocking tight end. The guy has great hands and ive seen him panckake some guys to the ground who are much larger. I think he is what this team needs - a guy who can do it all. Doug Flutie couldnt stop raving about him last season - said he was one of the best TEs hes seen. Im excited to see what he will bring this year. I'm a Saints fan and always thought Lawrie had a lot of potential when he was down in NOLA. Glad he got picked up in Philly.